Crazy Vegas Video Slot Guide & Review - Casino Answers! Crazy Vegas is a 5-reel, 20-line video slot developed by Realtime Gaming, featuring a wild substitute symbol, scatter wins, a free spins feature, a bonus game and a progressive jackpot. 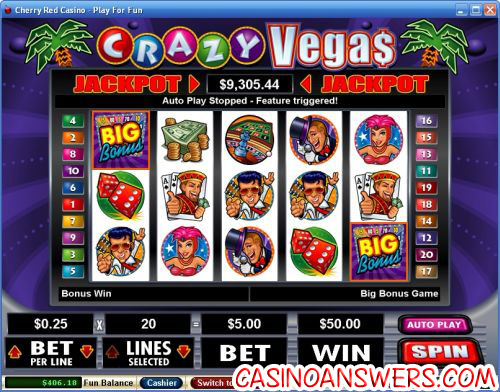 You can play the Crazy Vegas Real-Series Video Slot at US-friendly casinos Cherry Red Casino and Winpalace Casino. Select your bet per line on the Crazy Vegas video slot by using the arrows next to “Bet.” Bets available are $0.01, $0.02, $0.03, $0.04, $0.05, $0.06, $0.07, $0.08, $0.09, $0.10, $0.25, $0.50, $1, $2.50, $5, $10 and $25 per line. You can also select the number of paylines you wish to play (up to 20) by clicking the arrows next to “Lines.” The lowest total bet possible on Crazy Vegas is a penny per spin. The highest total bet on Crazy Vegas is $500 per spin. To play the Crazy Vegas video slot, hit the “Spin” button to spin the reels. At any time during a spin, hit the “Stop” button to use the skill stop feature and manually stop the reels on Crazy Vegas. Crazy Vegas is a unique video slot in that its substitute symbol and its scatter are the same symbol – the Crazy Vegas symbol. 3, 4 or 5 Crazy Vegas symbols anywhere on the reels will pay out 5X, 20X or 100X your total bet. The Crazy Vegas symbol will also act as a wild substitute symbol for all other symbols to create payline wins. The highest paying of the regular symbols in Crazy Vegas is the Cash symbol, which pays up to 300X your bet per line. 3 Free Spin symbols appearing anywhere on reels 2, 3 and 4 will trigger the on Crazy Vegas Slots. The Free Spin Chips will spin to reveal the number of free spins and the free spin multiplier. The sum of the first two chips is the number of free spin games you win. The number on the third chip indicates the multiplier you will receive. The free spins feature cannot be re-triggered. The free spins feature is an easy way to win big on the Crazy Vegas slot game at Cherry Red Casino. Above the reels of the Crazy Vegas video slot, you will see a progressive jackpot. At this time, the progressive jackpot is at $10,500 and increases by $1 about every fifteen seconds. The Crazy Vegas Progressive Jackpot can be won at the conclusion of any game. The Random Jackpot is triggered randomly and will be added to all other wins in the slot game. Wins on different lines are added together. Scatter wins are added to payline wins. Payline wins are multiplied by the bet per line. Only the highest win is paid per line. Maximum win per paid spin is 50,000 times bet per line. Hit the “Autoplay” button to open the autoplay settings on the Crazy Vegas slot game. You will be able to set the number of spins, set it to stop when the jackpot is won, stop if a win exceeds or equals (any amount you input), stop on any win, stop if your balance increases/decreases by any amount you input and stop once the feature is triggered. You can stop Crazy Vegas’ autoplay mode using the “Stop Auto” button. Turbo Play can be found in the autoplay settings. Crazy Vegas captures the feel of Las Vegas – not just the ambiance, but also the feeling you get when you win lots of cash! Crazy Vegas is a slot machine with everything you can ask for from a progressive jackpot, bonus game and free spins feature. You can get a $7,777 signup bonus to play the Crazy Vegas slot at Cherry Red Casino! I’m based in the United States. Am I able to play the Crazy Vegas slot game? 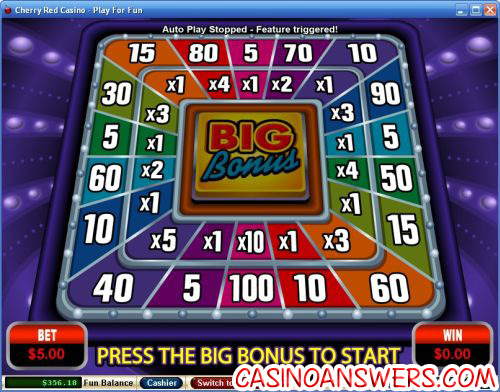 American players are welcome to sign up and deposit at many of the Realtime Gaming casinos. Two of the best that are accepting deposits from United States players are Cherry Red Casino and Winpalace Casino. Can I play a free Flash game of the Crazy Vegas slot machine? Unfortunately, Realtime Gaming only offers a select number of games on its Instant Play software and Crazy Vegas is not one of them. You can, however, play a similarly themed video slot called Vegas Party at Millionaire Flash Casino. Is there a Crazy Vegas Video Slot flash game?